Just like a bridge connects a road over an open area, dental bridges work by forming a connection between one or more teeth that have gaps. Unlike dental implants, bridges work by using surrounding teeth on either side as abutments for support, so you don’t have to have any drilling into your bone or go through surgery. A dental bridge improves more than just the way your mouth looks by filling in where teeth are missing, it also will restore your mouth to its natural function and makes eating and talking easier through the improvement of your bite. Additionally, by filling the space where teeth are missing you’re making sure to avoid having surrounding teeth shift or tilt. When this happens more extensive work will be needed to correct the problem and you’ll suffer from additional problems with your bite and aesthetics. 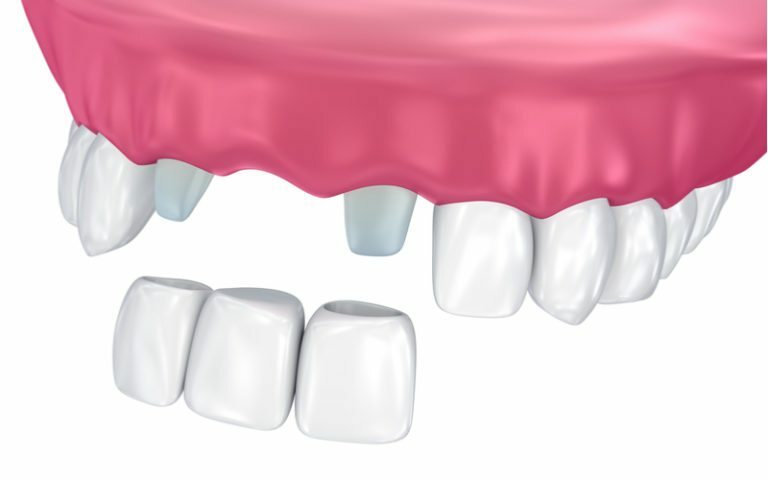 A bridge can be used to correct and fill the space of one or more missing teeth. You’re likely a candidate if you’re missing a tooth or have a tooth that needs to be extracted and would rather replace that tooth without surgery. As long as your surrounding teeth are healthy enough to support a bridge, you likely are a candidate for one. However, give us a call to schedule an appointment with Dr. Heidarian to determine the best solution for your tooth loss. What is the process of getting a bridge? Bridges are usually placed over a few visits. During the first visit, the doctor will examine your mouth, take x-rays and impressions (used to make your bridge), and map out the best treatment for you. During your second visit, Dr. Heidarian will prepare the surrounding teeth for the bridge, which will be placed at the final visit. Once your bridge has been created you’ll come in to have it fit and cemented. The cementing process makes bridges permanent. They can only be removed by an experienced dentist. What’s so great about dental bridges? One of the best things about dental bridges is the fact that they’re permanent. You’ll never have to worry about removing them to clean them. Simply follow your routine dental care instructions. Additionally, because bridges are permanent they tend to make eating and talking easier, unlike partial dentures which can slip or impede speech. Dental bridges last up to 15 years with proper care. A dental implant might be needed to help accommodate a bridge if several teeth are missing, however, the vast majority of bridges can be completed without the use of a dental implant. If you believe a bridge might be the best solution to your tooth loss, contact us. We’d be happy to answer any questions you have and get you in with Dr. Heidarian to discuss the best options for your needs.